If ever there is a time of year to come up with crazy drinks and thematic brews, now is the time. And none to soon, as Halloween tricks and treats are just around the dimly lit, spider infested, witch crouching corner. As gin so infrequently grabs my attention, I thought now is as good a time as any, to give it its hypnotic due. 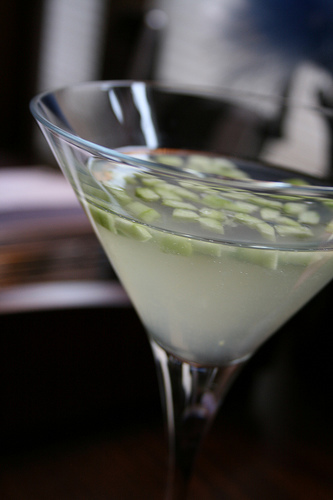 This drink resonates with a cucumber gin gimlet, though with a few slices of a knife, and the aid of some simple syrup, it quickly takes on a new personality. Add as many or as few little floating maggots (finely diced cucumber, no peel) as you desire, and feel free to thicken the liquid itself with gooey piles of cucumber pulp---for stomach churning effect. Peel cucumber, halve and scoop out seeds/pulp (with small spoon). Press pulp in mesh strainer for 'cucumber juice.' Finely dice cucumber and add to drink. Stir to blend (or use shaker) gin, tonic, lime and cucumber juices and simple syrup. Splash with soda---flash a wicked smile---and serve. Note: click here to learn how to make simple syrup. I just used blue agave sweetener; it is quite trendy and perfect for storing and using in iced coffees and cocktails when you need a liquid sugar. Nov 2 Is that turmeric in your eye? Nov 12 Pom-tinis & Dropping pombs.